Go out and play! EastSevens recommendations for outdoor activities! To keep yourself in shape and to prevent immense boredom we thought you might be interested in doing some outdoor activities while staying at our hostel. Therefore, since the day of today, we have a basketball and a table tennis set for you to get at a 10€ deposit from the reception. This is the park that is closest to our hostel. When you get out the door take a left, than take the first to the right, and the park is on your right hand side after a few meters of walking. Go here to play table tennis. After that relax and drink a beer. 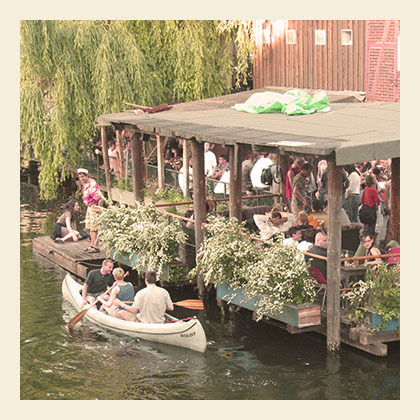 Yes, in Berlin you can drink outside! You can also bring your kids, there is a nice playground there. The Wasserturm is the unofficial symbol of Prenzlauer Berg, this 30m high tower was built in 1877 as the local water reservoir. Once used by the Nazis as a prison, today the round brick Wasserturm has been converted into trendy apartments. Check for art exhibitions next to the tower, in the underground reservoir. The park that surrounds the Wasserturm is relaxed! there is a huge playground, a fountain, trampolines and a table-tennis spot (3tables)! Also you can play basketball and soccer! anti-aircraft bunker from World War II, as well as several tonnes of bombed out rubble. beachsports. Its free to use for anyone but you´d have to bring your own equipment. And of course you can also find table tennis spots in this huge, forest like park. okay if you really don´t want to leave the hostel and hang out here, you can hang out in our lovely garden. There is a Hammock where you can chill out. And when it gets really hot you can even take a shower in the garden. Isn´t that cool? Also we have a table football, so you can play a match with your fellow travelers. And why not go organize a barbeque-party? We have a grill free to use for all our guests. If you are planning to come to Berlin you are more than welcome to reserve a bed at our cozy hostel in Berlin Prenzlauer Berg. Looking forward to meeting you!